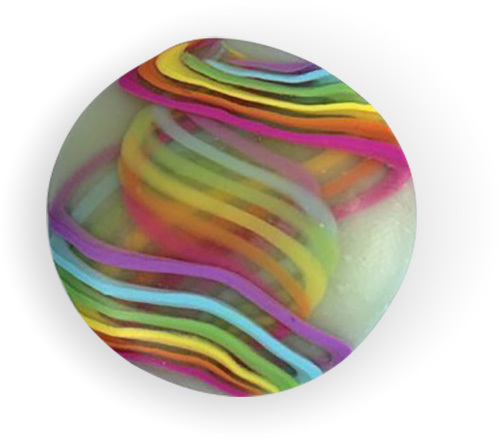 Meg Newberg has been on a translucent jag with her Polymer Clay Workshop monthly tutorials lately. If you like canes, Meg’s monthly dose of new ideas via email can fuel your cane brain at a very reasonable price. You can glean some translucent ideas from her YouTube video (no audio) but you’ll need the written tutorial to get a complete load of goodies. Little translucent canes go a long way and Meg shows you how to stretch their usefulness. I’m on vacation this week and while I thought I could keep up on the road, I was mistaken. Sometimes you just have to back away from the machine. No promises for the rest of this family week. Berlin’s Izabela Nowak’s new line of Slice Up jewelry takes us back to interlocking paper constructions of childhood. 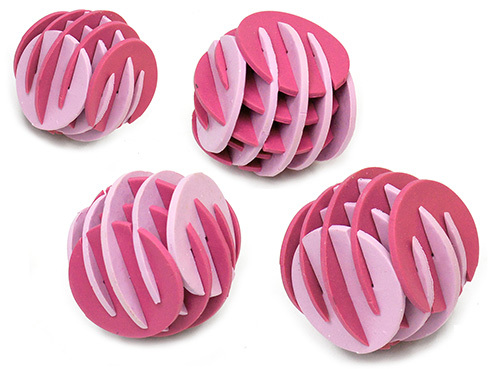 These round beads are assembled from flat disks so they must be put together after baking. She continues with other treatments, playing with shapes and colors that reveal different colors and patterns on each surface. Look at Izabela’s growing collection of color-shifting beads on Flickr. Did PCD miss a day? Why yes we did. Let’s say it was in celebration of summer and in an attempt to clear my desk before leaving for family time out west. StudioMojo is fresh and ready for your Saturday enjoyment but that Thursday post slipped right by me. It happens. If you feel you’re missing out, join us! 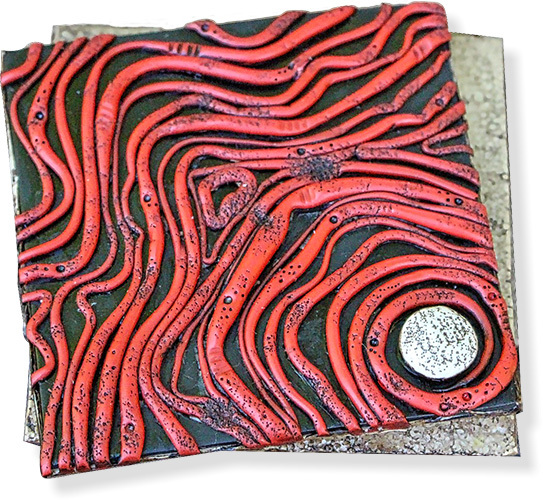 The mini-book samples like this red one from Lucy Frycova came out of a recent class taught by Spain’s Fabi Ajates. The cover swivels on a screw (I’m guessing) to show the book’s hidden message. Lucy shows several other versions on her FB page. This one is mysterious and multilayered. Fabi designs the coolest projects that retain their freshness no matter that they’re samples from classes. How does she get her students to do that? This superfast video from Moscow’s Galka-Vasina starts the day with a most welcome kick in the pants! 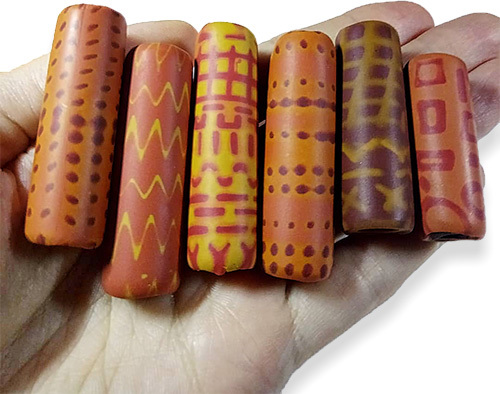 I had admired how foggy and amorphous her graphic-patterned terra cotta beads looked. One glance at the video and you’ll be smacking your forehead like I did. Nuff said! Looks like they’re soon doing a live online event about these methods if you care to figure out the time change. 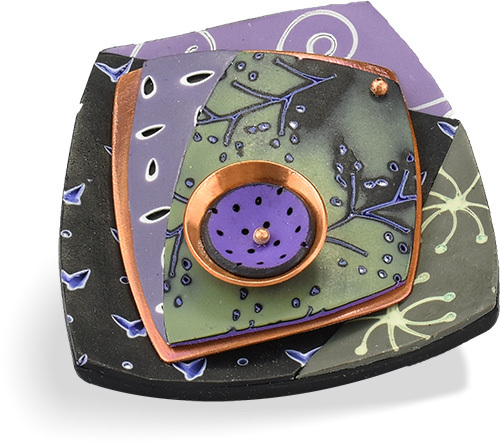 Colorado’s Phyllis Pollena-Cahill mixes her media in this polymer and copper brooch. The patterns flow into each other and keep your eye darting between the variations in the layers that cup forward. The copper accents hint at even more complexity. It’s a delight to take in this big story in a small space. Nice start to the week, eh? Find more of Phyllis’ story on Instagram, Facebook, and Flickr. Boofant showed up on Amy Koranek’s Facebook page. Amy couldn’t resist Boofant’s request to be taken home from the gala weekend at Creative Journey Studios grand opening in their new Atlanta location. 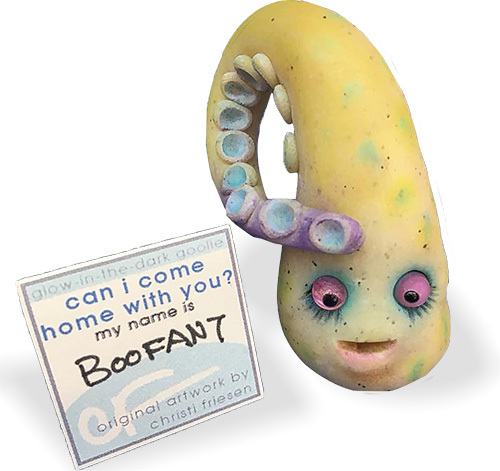 Christi Friesen rids her mind of gremlins, grouches, and goofballs by capturing creatures like BooFant in polymer. They seem pretty harmless and are very endearing – especially with the plea to be rescued (clever marketing). Christi knows how to let her imagination and her humor run wild and that’s a talent.